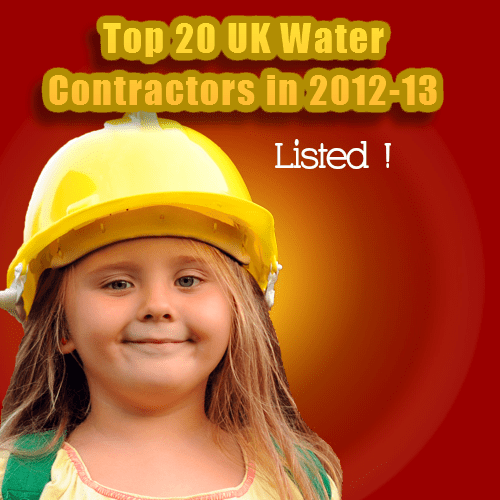 The following is a list of the top 20 UK Water Contractors for 2013, taken from the 2012 NCE Contractors File, which was produced from a questionnaire which was completed by UK Civil Engineering Contractors in 2012. The list is in descending order with the highest turnover companies at the top. This list of the Top 20 UK Water Contractors in 2012-13, is available to Members of the Institution of Civil Engineers, and to anyone who subscribes to the New Civil Engineer Magazine. For more information visit the NCE website at http://www.nce.co.uk/ . In the past we have listed the top Waste Management Facility Civil Engineering Contractors in our top 20 lists. This is no longer reported by the NCE as a specific sector, and for that reason w ave listed the Water Sector top 20 here. Many of the above, water (engineering/ infrastructure) sector contractors would also appear in any list of contractors involved in the waste management sector, as landfill development works contractors. NCE States: Information is based on the results of a survey of firms conducted by NCE in June 2012. Figures relate to the financial performance of contractors to the latest last year end for which audited figures are available. Maybe you would like to look at the List of 2014 UK Consultants listed here.